We are running into issues on the shed, but Brian has come up with a way to install the columns on the front of the shed. 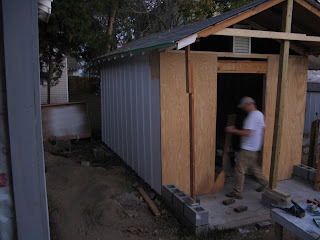 He has decided to build a low concrete block wall on each side of the 'front (grilling) porch' that will allow him to set anchor bolts for the column base. Sunday we only had a few hours to work, with other stuff going on, but Brian managed to make some progress on the low walls, and I painted the first coat of white paint on one side of the shed. This is taking longer than anticipated, due to the fact that I am rolling the paint on, since I can't seem to figure out my new paint sprayer. Sad.